I spent a little bit of time during spring break to clean up my blog and learn about interesting features. 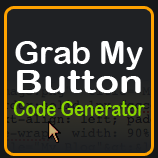 I became determined to add a "button," not that I really need it, but I just wanted to know how to do it. This was so helpful. This free site took my information and created the text I was struggling with and now I have a button.